My forays into Canadian whiskies has largely consisted of Canadian Mist and Crown Royal. When Collingwood released a 21 year old rye whiskey, made from 100% rye, aged in oak casks and finished in a toasted maple casks, and at a very affordable price for its age, I had to give it a try. I could not have been more pleased with a purchase than I was with this one. I have always found Canadian whiskies to be softer whiskies, offering more subtle flavor as opposed to the bold, more punch-you-in-the-face flavor that many bourbons have. The subtlety of this whisky's flavor is what makes it great, though. With each sip I found myself noticing something different and each time completely enjoyable. It is a sweet whisky. Perhaps my mind was tricked by the marketing, but the maple flavor seemed to stand out the most. I feel I must clarify, though. When I say maple flavor, I don't mean maple syrup. I mean it tastes like freshly cut maple wood smells, which to me is a wonderful smell. The maple flavor was there just enough to be noticed but not enough to be offensive--a slight but sweet woodiness that did not overtake the whisky. The sweetness of the whisky is casually followed by the rye spice, almost unexpectedly. 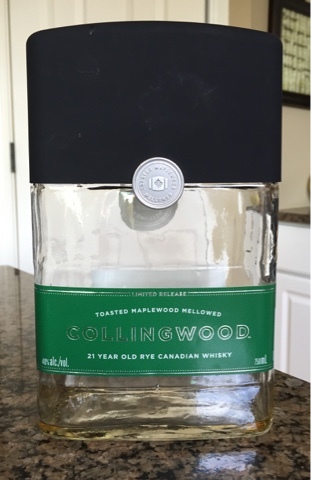 The combination of the rye bread notes with the maple notes provided a great mix. In later pours, milk-chocolate flavors came through, reminding me of the smoothness of good chocolate after it melts in your mouth. Again, the mix with the maple and rye flavors continued to work well, and with each pour I found myself eager for the next. Ultimately, all the flavor balanced well with the expected woodiness of such an aged whiskey. While it's a dry whiskey, again, it's not too dry, and the wood undertones were, again, prevalent enough to be enjoyed without taking over the flavor. Usually I tend to ding a whisky for lacking in boldness. However, in this case, it's the subtlety of the flavors that makes this whisky. Even at only 80 proof, there's a lot going on here, and, while the flavors may not be strong, they are nonetheless excellent and I really enjoyed taking my time with each pour to discover each note. My only criticism is the oddly shaped bottle that looks like an over-sized bottle of cologne. But Collingwood loses no points for this, as it's what's in the bottle that counts.